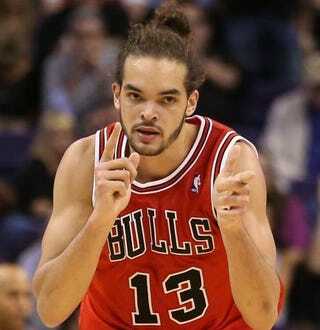 NBA superstar Joakim Noah is suing French shoe company Le Coq Sportif for making crappy shoes that the Chicago Bulls center believes damaged his feet, TMZ Sports reports. According to the sports gossip site, Noah filed a lawsuit against the shoe company in a Washington, D.C., court in November claiming that LCS reneged on his six-year, $6 million deal he signed back in 2007. The Associated Press reports that the suit filed by Noah claims that shortly after LCS signed him, it shut down its U.S. offices and started looking for ways out of the contract. According to TMZ Sports, Noah claims LCS shorted him some $1.65 million when they stopped paying him. Noah also claims that even though the two sides were at odds, he continued to uphold his end of the bargain and wore the sneakers in every NBA game even though they were not well constructed and they "… likely contributed to [my] development of plantar fasciitis." The medical condition caused Noah to "… miss several games during the 2012-13 Chicago Bulls NBA season, including key games in the NBA playoffs."